Experience the most wonderful day of your life at the Alemannenhof in Schallstadt-Mengen. We offer the ideal conditions for an unforgettable wedding day. Our little wedding paradise will ensure pure romance. The ‘Fireside Room’ in elegant English style with fireplace, marble and parquet can accommodate up to 70 wedding guests. Our ‘Marie-Louise’ ballroom in original empire rococo style, makes a stylish highlight for every great wedding party. 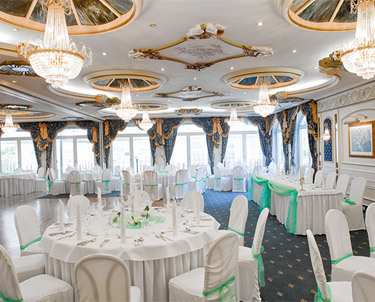 The ballroom is fully air conditioned and provides sufficient space for a wedding crowd of up to 120 people. Are you getting married? We look forward to arranging a personal meeting with you. We offer a fully personalised consultation. For all aspects surrounding the most important day in a couple’s lives here at the Alemannenhof. So that it will also be your most beautiful day. Our wedding present for the bride and groom: One night’s stay in our wedding suite including complimentary breakfast. The 50 square metre wedding suite in empire rococo style with spacious bath will complete your dream wedding at the Alemannenhof. The cookie settings on this website are set to "Allow cookies" to provide the best browsing experience. If you use this website without changing the cookie settings or clicking "Accept", you agree.